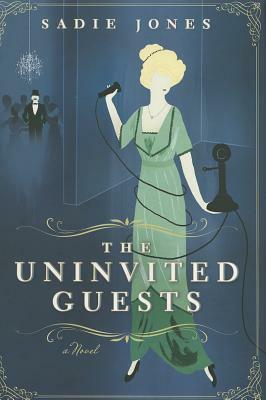 The setting: The Uninvited Guests takes place in one evening at the Sterne house. The Torrington Family is throwing a birthday party for Emerald. While it may seem like a simple evening- the family is worried about losing the house and the quiet party gets interrupted by a train crash nearby. The railway tells them that it is their duty as the closest estate to take in the travelers until the railroad can be fixed and they can continue on their way. Although as the night progresses, something seems off about the travelers and the Torrington Family experience a lot more than they expected. It's hard to talk about this book without giving too much of the twist away. It was a very enjoyable and a very quick read. I found myself narrating it in a voice similar to the narrator from "Pushing Daisies" or "The Hitchhiker's Guide To The Galaxy" and I think that made it infinitely more entertaining and I highly recommend doing that. The book is a comedy of manners set at the turn of the century. There was a lot of commentary on what the proper thing to do was. Such as: "The traveler's are third class citizens, is it really necessary to feed them?" Or "Fine we'll feed them, but does it have to be the food from our feast?" I think my favorite character was the youngest daughter, known as Smudge, who wanted nothing to do with the party. Instead she was plotting what she called "The Great Undertaking". Smudge's pass time was tracing all the animals of the house onto her wall. She had already traced all of the dogs and cats- and so while the family was trying to organize dinner, she decided to sneak a pony inside to trace it on the wall. She was... somewhat successful. Overall it was a really enjoyable book that I definitely recommend you check out. Thankfully HarperCollins sent me 2 copies of the book. So I don't have to be selfish and keep this darling little book to myself. So it's GIVEAWAY TIME. I will be giving away both copies. So follow the directions on the Rafflecoptor and 2 lucky winners will be chosen (at random). Good luck! I would love to win this book as I'm on the wait list at my library. Re: collections... I collect handbags! I switch my bag at least once a day, if not more! My dad collects old glass bottles. He finds them on various shores and has a pretty neat collection of them. Thanks for the giveaway! This book sounds like fun! The most interesting thing are elephant tchotchkes from different places of travel around the world. How about the most disturbing thing I've ever seen someone collect? That would be clown memorabilia. So disturbing. I am not entering because I have already read the book. But I must say I loved it and Smudge was my favorite too. I had a friend who collected pigs. Stuffed pigs, ceramic, plastic...just tons of pink pigs. I thought that was weird :). My great-aunt used to collect angel figurines. A friend of mine's grandpa collects Santas (which isn't weird) that he keeps around the house year round (which is). I love Christmas too and have been known to watch Elf and listen to Christmas music year round, but the Santas is a step too far, I think! This book sounds great! Reminds me of Gosford Park (the movie). Sounds like a Depp movie! Sounds like a fun read! My kind of book. I collect small boxes from places I have visited. My Dad used to collect cowbells, real ones that cows wore, not the kind you buy for a drum kit. He would find them in old barns and bring them home. I still have two on my desk to remind me of him. Thanks for the giveaway! I have been wanting to read this book! Sounds interesting...that quote is hilarious by the way! I find myself narrating in that voice sometimes too, I'm glad to know it's not just me. My dad recently gave me a locked box full of change he collected when he was a boy...I thought it was odd that he'd been keeping a box full of spare change for 40+ years. I've been wanting to read this one for a while. I love the way you described the narration! I don't collect anything very interesting - mostly books and piano music. I've read several highly positive reviews of this one so far, and really must pick up a copy (sadly I'm not eligible for this competition). All last fall my son would bring home dead leaves that he found on the ground. From anywhere. And kept them all on a shelf in his room. I felt bad but I finally made him through them away. They were dried out and starting to crumble everywhere. It was not a good collection. I worked for a Crown Attorney (like a DA but in Canada) who still collects autographed vinyl albums … the thing is, if the artist doesn't release on vinyl, he's not interested. He had thousands of them - some addressed to him, some to his wife, and some to his kids. Amazing, the time he spent on them! My cousin collects sand (or dirt) from her travels. She has volunteered in many different areas, so she has film canisters filled with sand from Papua New Guinea, Brazil, India, Mongolia, and more. I collect vintage Pyrex...but that doesn't seem to quirky!! Oh well.